Thus, American Hustle. The film, loosely adapted from the Abscam FBI operation from the late 1970s, is a well-acted period piece featuring plunging necklines, big collars, outrageous hairdos, and equally-outrageous performances from past Russell collaborators, Christian Bale, Bradley Cooper, Amy Adams, and Jennifer Lawrence. 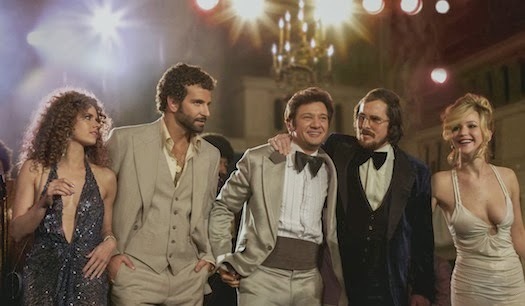 But with only the vaguest semblance of a story and very few actual heroes, it's difficult to know who to root for in American Hustle. Bale and Adams portray con artists who woo struggling business people into their trap through promises of a British investor to free them from financial troubles. Cooper is the frenetic FBI agent who catches them, forcing them to work undercover to entrap politicians taking financial bribes. Lawrence is Bale's hysterical wife, giving a performance so passionate and over-the-top, it almost becomes distracting. I recall consciously thinking in the theatre, "this is some good acting." But shouldn't the best acting cause us to forget that these are actors in the first place, capturing our imaginations and hearts with such pathos and empathy that we are drawn to the character, not the actor? It doesn't make much sense. It's still a great scene. Sure. Whatever. Let Lawrence dance and sing. Put Louis C.K. in there as the most memorable supporting character in the bunch, and you've got yourself an award-winner. What is the heart of American Hustle? It comes down to empty pursuits and false identities, how we grasp at dreams for success and fame and fortune, only to come up clutching at sand. It's a story we've seen and heard before, perhaps even a story we've lived. Russell's version of this common tale shows us some great actors giving great performances, but falls short of the redemptive truth the great stories offer to our minds and hearts. The film will probably garner some awards at the Oscars, but even those will eventually collect dust on the shelves of the winners. I and my wife saw this movie and were disappointed. I don't understand why its getting so much Oscar buzz?